Innovative technology has been a driving force in our rapidly changing world. The newest gadget, the most popular smartphone or 3D Televisions are consistently feeding a technology hungry adult audience. Adults might be buying these exciting and progressive devices, but their children are the ones benefiting from the featured educational programs. 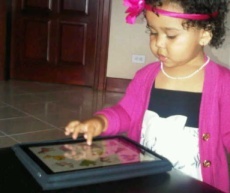 According to Parents Magazine’s Margery D. Rosen, “60 percent of the top-selling apps on iTunes target young children”. It is amazing to think that at 2 years old, a child can play a game that is educational on a touch screen phone. Margery’s article, “Is Technology Good For Little Kids?”, refers to a statement by Deborah Linebarger, director of the Children’s Media Lab at the University of Pennsylvania. FasTracKids believes that technology can benefit early childhood education, in moderation. That is why FasTrackids’ programs use Educational Zigzagging, the promotion of repetition without learning it the same way twice, to help children learn through technology and from teachers. The Learning Station is the technology that delivers our programs, but it is a child’s improvement and early love of learning that helps them succeed in school and in life.